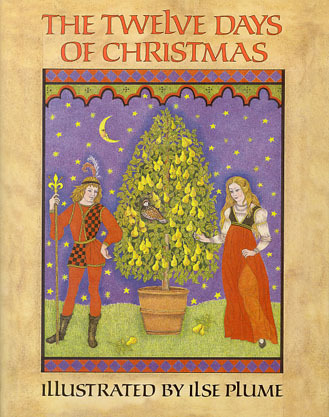 Drawing inspiration from centuries-old illuminated manuscripts, Caldecott honor-medalist Ilse Plume here creates an Italian Renaissance setting for the lyrics of The Twelve Days of Christmas. Twice a resident of Florence, her soul “forever touched by the rays of Tuscan sunlight,” she has pored over numerous books of hours, bestiaries, and miniatures in search of imagery that might “convey the atmosphere, both tangible and intangible, of a particular time and place”: a Florentine garden of the late fifteenth century. Plume’s exquisite images, created in gouache and colored pencil, are rich in royal purple and gold, glowing vermilion and verdant green. 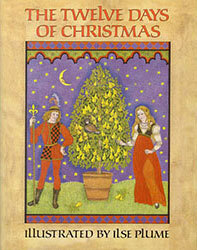 In each, a beautiful, shy, young noblewoman with magnificent yellow tresses graciously receives a gift from her handsome Romeo: a brown partridge in a fruit-laden tree, two turtledoves in a golden cage … and, finally, twelve lords a-leaping, in the form of twelve ornamental figures for the lady’s Christmas tree.